I had two BIG babies in two years. In addition to experiencing significant diastasis recti after both pregnancies, I also developed an umbilical hernia after pregnancy with my second son. 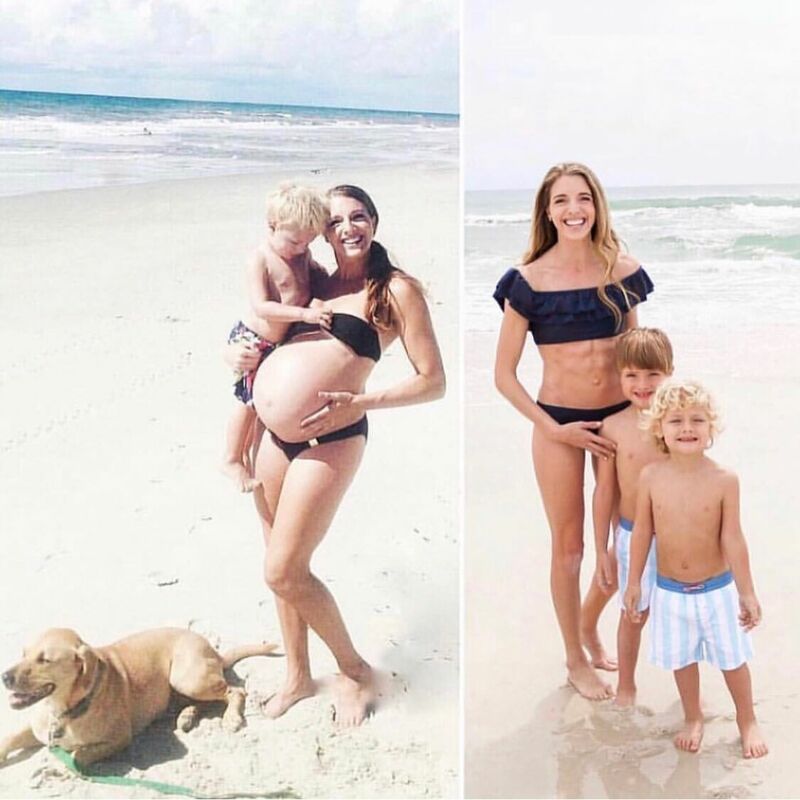 Every mama expects pregnancy as a time of changes to your body, but after that sweet bundle of joy is born, many moms expect all of those changes will disappear… and sometimes they do. But sometimes they don’t. For me, the “outie” bellybutton that popped out during pregnancy never went back to normal. Postnatal changes like what I came to find out was an Umbilical Hernia, can bring up lots of questions, so if you’re unsure about any body changes, it’s always best to consult your doctor. For me, I saw my OBGYN and then was referred to a general surgeon for a consult. It turns out that my “outie” really was an umbilical hernia after pregnancy. I had lots of questions about my umbilical hernia after pregnancy. And if you have one (it’s fairly normal after pregnancy), I’m guessing you may have the same questions as well…. So, what is an umbilical hernia after pregnancy? Is the only treatment option surgery (keep reading below to see how mine was treated)? What do you need to know if you have an umbilical hernia after pregnancy? Just like with the development of Diastasis Recti, the excess intra-abdominal pressure that develops in your abdomen and pelvis in pregnancy pushes the organ outwards. The pressure is so severe that a part of organ or tissue protrudes through your abdominal wall, and a bump appears at or nearby of your belly button. More than one pregnancy: If you have had twins or conceived for two or three times with less time gap in between then your muscles tend to weaken, which also triggers the risk of a hernia. Overweight: If you are overweight then the chances of getting an umbilical hernia is more, as it weakens the elasticity of your abdominal muscles. Long hours of labor: A prolonged labour delivery can also be a cause of an umbilical hernia, as it strains and stretches the abdominal muscles. Weak core muscles: If your core muscles are not strong enough then it might lead to an umbilical hernia. The core muscles support your spine, waist, lower back, and abdomen. So, it is important that these muscles are strong enough to support the body. Accumulation of fluid in the abdominal cavity: Accumulation of fluids in the layers of abdominal wall and abdominal organs may also lead to an umbilical hernia. Excessive strain: Straining due to prolonged coughing, lifting heavy weights without proper form, or sneezing continuously can also increase the risk of an umbilical hernia. Abdominal Surgery: Previously undergone abdominal surgeries or c-sections may also lead to the cause. Mild pain and swelling in your lower abdomen. The pain and burning sensation will increase when you are lifting heavy weights, coughing, sneezing or during bowel movements. In case of strangulated hernia which causes rigidness and severe pain in the abdomen, you need to get medical treatment immediately. You may see visible skin symptoms as a hernia develops after C-section delivery around your abdomen. The skin on your belly button becomes loose and bulges out. A hernia restricts your blood flow to the intestines which causes the skin around the affected area to become reddish blue. You may also experience nausea, vomiting, blood while passing stool, and gastric trouble when you are affected by a hernia. If this happens, it’s advised to talk to your doctor right away. A surgical treatment will effectively strengthen the weakened muscles of the abdomen and push the tissues back to its place through open surgery. You may also opt for laparoscopic surgery which is less painful and more effective with minimum recovery time. The chances of re-appearance of a hernia are also less in this case. But it is highly recommended that in case your hernia is not severe then you perform physical exercises (like Mom Tummy Rehab) to strengthen your core muscles. After consulting with my surgeon, we decided that my umbilical hernia after pregnancy was small enough not to need surgical treatment. The surgery would have been purely cosmetic, so I opted for non-surgical treatment of my umbilical hernia after pregnancy. Doctors won’t always advise surgery to fix a hernia and sometimes they may suggest you leave it alone. As I mentioned above, unless the umbilical hernia after pregnancy is severe, most of the doctors prescribe regular rehabilitation exercising and stretching instead of surgery. Exercising naturally strengthens the weaker muscles and eases the protrusion back to normal. Performing exercises that will not put excessive pressure on your abdomen and pelvic muscles will give better results. Breathing exercises, strengthening and stretching will help immensely. In order to relieve the pressure inside your abdomen, it’s important to correct improper alignment and poor posture. Avoid the urge to tuck your backside underneath you, or walk in high-heeled shoes all the time, which thrusts your pelvis out in front and strains your hip flexors and knees. Note: Avoid exercises that strain and increase pressure on your abdominal wall and pelvic floor. It’s important to learn to do the right core exercises and learn how to use your core effectively and optimally. It’s important to understand the severity of your hernia. Is it more a cosmetic issue? If it is very slight and does not cause much discomfort, then it can be left untreated, but regular exercising including rebuilding and reconnecting with your core is a must. 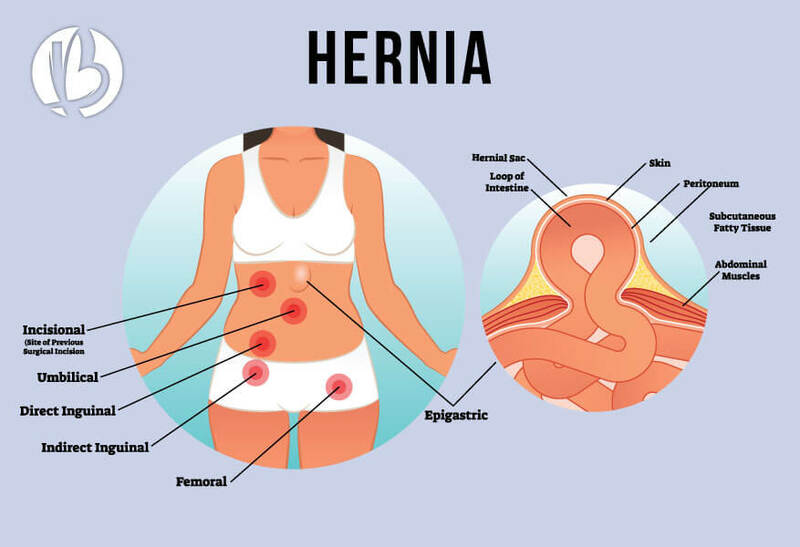 However, if you suffer from a severe hernia, then you require immediate medical attention as it can cause serious effects like uncontrollable abdominal pain, and less blood supply to your intestines. Hence, it is advisable to have an open discussion with the doctor before pursuing any kind of treatment or exercises. A hernia is a serious medical condition with dangerous effects if left untreated. So you need to consult your doctor even if you do not experience severe pain or discomfort. Prevention is always better than cure. Regular exercising with proper core training post-delivery is very necessary after pregnancy. BeyondFit’s Mom Tummy Rehab program is the online, physician recommended exercise and recovery program that I created for myself after pregnancy. You’ll get step-by-step instructions and exercises that only takes 5 minutes a day. With this12 week program you will strengthen your core and pelvic floor, realigning your posture to reduce intra-abdominal pressure, as well as relieve back pain, flatten your tummy and tone your stomach.